Included: The IQAir HealthPro ® Plus comes complete with filters, user manual, handsigned guaranteed Certificate of Performance, set of 4 casters, 10 foot power cord, user guide video (both VHS and DVD) and remote control with batteries. Other Information: The IQAir HealthPro ® is part of the world's most advanced line of air cleaners available for homes and offices. The HealthPro ® uses superior HyperHEPA technology that is used in today's modern million-dollar cleanrooms and hospitals. As a result, this air cleaners removes more pollution particles, such as allergens and dust from the air than conventional air cleaners, including conventional HEPA air cleaners. The IQAir HealthPro ® can at any time be upgraded by the user to also control gaseous chemicals and odors with the HealthPro ® Plus upgrade kit. 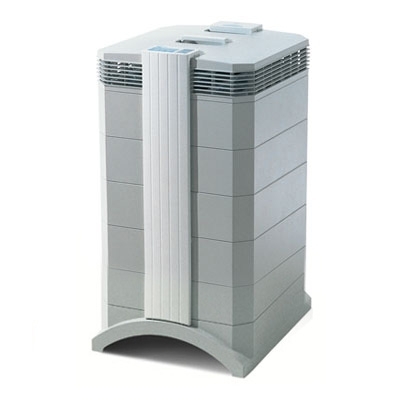 Notes: One of the world's most efficient HEPA air cleaners in its class. Incorporates H12 13 class certified HEPA filter, normally used in multi-million dollar cleanrooms. This certification under the world's most stringent HEPA filter test, European Norm EN 1822, is the basis for this air cleaners' ability to capture up to 100 times more particles than conventional HEPA cleaners. In fact, while other air cleaners are rated only for particles down to 0.3 microns, IQAir systems have been found to remove particles down to 0.003 microns with close to 99.5 percent efficiency. Suggestions: For control of particles and a wide range of gaseous chemicals and odors see our HealthPro ® Plus model. For specific control of gaseous compounds see our GC ™ Series models. For hospitals, laboratories and clean manufacturing of particles, microbiological contaminants, bacteria, and viruses see our Cleanroom H13 ™ model. For dental offices see our Dental Series models. Power Requirements: 120 V, 215 Watts, 50-60 Hz. The entire electrical system is UL certified. Pre-Filter Surface Area: 25 sq. ft.
Pre-Filter Frame Material: High-capacity mini-pleat design with solvent-free separators.